Our Publications HUGE SALE! 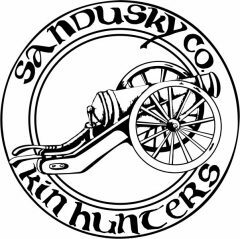 – Kin Hunters of Sandusky County, Ohio, Inc. This publication has taken a copy of a 33″x44″ drawing of the Firelands as it existed in 1808 and reduced it and made it readable on 11×8.5 inch paper. An index lists 140 family names showing the approximate location of their dwelling in 1814, family origin is also shown. 36 page booklet originally written for the Golden Anniversary of Rollersville School. Many names and pictures. Re-printed. After several years of work, member Ken Smith has compiled an index of marriage records in Sandusky County, Ohio from 1820 thru 1894. This publication has over 700 pages; list alphabetically by Groom and by Bride. Contains over 16,000 record entries between 1820 and 1894. Published in 2005. Shows Names, Dates, and Volume & Page of marriage Record. This 14″x17″ book is a second reprint of the original atlas published in 1874. Published in 1998 this book contains over 5400 indexed names on 222 ancestor charts completed and submitted by Kin Hunter members and friends. A great resource. Published in 1992, this book contains over 3900 names of individuals associated with Sandusky County that served in the Civil War. The book lists alphabetical the names of the individuals, date and place of enlistment, length of service, branch of service and rank, and disposition by war’s end. Also included are several letters from the soldiers in the field. A great book to have. 400 pages. This book was published in 1990 and includes 77 pages of indexed property owner names and atlases of Cities, Villages and Townships of the County in 1860. This book published in 2004 has 65 pages with nearly 380 surnames with locations on Township atlas maps. This 329 page book published in 1990 contains an indexed list of names from the 1850 census of Sandusky County. Each name is referenced to a roll and page number of the census. Published in 1991, this book contains over 4,600 names. Written by Gene Long and published in 2001, this 144 page book features hundreds of family names, pioneer stories, and the building of the Township over 170 years. Includes over 60 pictures. This two volume set contains over 23,000 indexed names listing the child and parents name, date and place of birth. Volume I has names A-K, and volume II has L-Z. Published in 1998. Listings for over 90 known cemeteries and burial places in the county. Indexed by over 160 known names. Location by map and township. Photos and driving directions for easy locating. History and information where available. Published in 2000. This book with over 6,700 indexed names includes the St. Lawrence, Quinshan, West Union and North Union cemeteries in Madison Township. Published in 1994. Published in 1994, this book contains over 6,000 indexed names from Woodville, Westwood, Sugar Creek, and Woodville Catholic cemeteries. This book with over 2,200 indexed names includes the Hite, Ludwig, Calvary, Shawl, Smith and St. Mary’s cemeteries in Jackson Township. Published in 2001. This book, with over 2,800 indexed names includes the Hessville, Overmeyer, Washington Chapel and Lindsey cemeteries in Washington Township. Published in 2004. This book published in 1995 contains over 6,400 names from McPherson Cemetery in Clyde, Ohio. USE THE PRICES ON THIS PAGE. DUE TO LOWER SALE PRICES THE 7.25% TAXES AND POSTAGE 0f $5.00 ( no matter how many books you order) ARE NO LONGER INCLUDED IN THE PRICES.